Landmannalaugar - lime green moss along Road F208 iceland. A field of lupins with the mist of Blue Lagoon in the distance. Taken near Reykjavik Iceland. Also known as lupinus or lupines. Photo taken in daylight at midnight in June. view from top of Ljotipollur - explosion crater in Iceland. 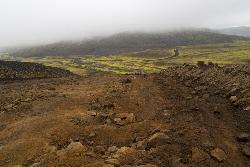 Photo of view from top of Ljotipollur, explosion crater in Iceland. This is in the region of Landmannalaugar. View of Hnausapollur from the top of Ljótipollur in Iceland. Photo of a sign for Fjallabak Nature Reserve along F208 Landmannalaugar. Zooming in, it shows a good map Landmannalaugar area. from site: The Fjallabak Nature Reserve is somewhat hidden behind the usual tourist trail of the Ring Road as it passes southern Iceland. Yet this is a wonderful place to visit, and only a short distance from the beaten track. from site: The Fjallabak Route (F208) is a spectacular alternative to the coast road between Hella and Kirkjubæjarklaustur. It passes through the scenic nature reserve to Landmannalaugar, an area of rainbow-coloured rhyolite peaks, rambling lava flows, blue lakes and hot springs which can hold you captive for days. Much of the route is along (and in!) rivers and therefore unsuitable for 2WD vehicles. Landmannalaugar - the rough road along Road F208 iceland. 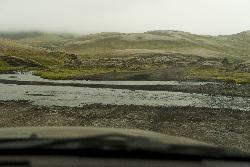 A photo showing the rough road along F208 in the region of Landmannalaugar in Iceland. Road sign for Eldgjá and Ófærufoss Waterfall in Iceland. Road sign for Eldgjá and Ófærufoss Waterfall in Iceland. The sign is located on F208. Eldgjá is a volcano valley in which is Ófærufoss Waterfall. Photo of the west side of the mountain Lómagnúpur in Iceland from Ring Road 1 (Lomagnupur). This mountain is 688 meters (2250 feet) high. from site: Mosses are small flowerless plants that typically grow in dense green clumps or mats, often in damp or shady locations. The individual plants are usually composed of simple, one-cell thick leaves, attached to a stem that may be branched or unbranched and has only a limited role in conducting water and nutrients. Although some species have vascular tissue this is generally poorly developed and structurally different from similar tissue found in other plants. from site: Facts and information on Mountains for kids, including the five different types of mountains that exist. from site: A mountain is a large landform that stretches above the surrounding land in a limited area usually in the form of a peak. A mountain is generally steeper than a hill. The adjective montane is used to describe mountainous areas and things associated with them. Landmannalaugar (Icelandic, meaning the people's pools) is a region near the volcano Hekla in southern section of Iceland's highlands. from site: A remote encampment consisting of a campsite, and accommodation hut as well as basic amenity huts including an excellent shower block and a small shop.